BlacKkKlansman is based on a true story, but is maybe a bit heavy-handed at times. The true story behind BlacKkKlansman is so fascinating that it would be tough for any filmmaker to screw it up. In 1979, when Ron Stallworth was the first (and only) black officer in the Colorado Springs Police Department, he responded to a newspaper ad seeking new members for the local chapter of the Ku Klux Klan and found himself bonding over the phone with leaders of the white supremacist organization — including, eventually, national director David Duke. With all of his contacts believing that he was a white man, Stallworth became an upstanding member of the KKK and spent nine months investigating the organization's illegal activities, sending a white fellow officer to pose as him for in-person meetings. 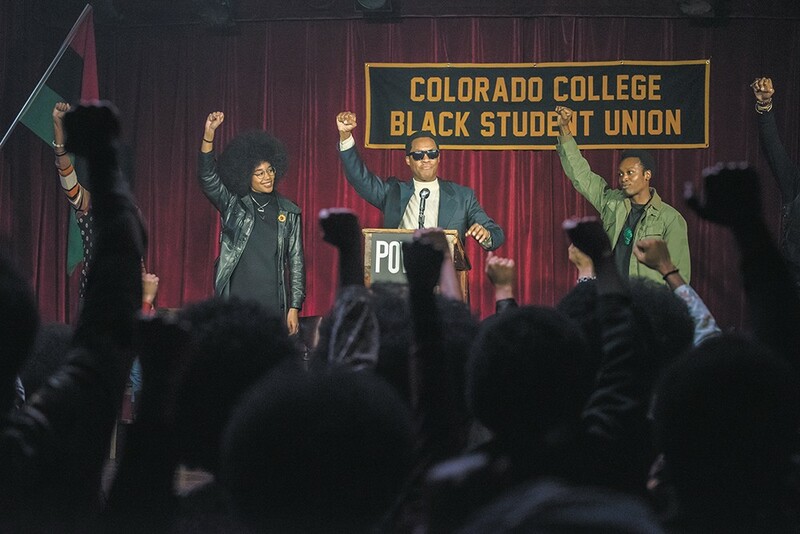 Having Spike Lee helm the movie based on Stallworth's memoir is a risk: The veteran provocateur's films are as often messy and incoherent as they are incendiary and rousing, and there are moments in BlacKkKlansman when Lee (who also co-wrote the screenplay with Kevin Willmott, Charlie Wachtel and David Rabinowitz) overplays his hand, especially in tonally jarring sequences at the movie's beginning and end. But Lee also gets very strong performances out of John David Washington (son of Denzel) as Ron Stallworth and Adam Driver as Ron's initially reluctant partner Flip Zimmerman, as well as a surprisingly powerful turn from Topher Grace as David Duke. The story's inherent outrageousness is more than enough to grab audiences' attention without Lee adding an extra layer of shock value. After a bizarre prologue featuring Alec Baldwin as a racist academic who keeps stumbling over his white supremacist talking points, BlacKkKlansman settles in on Ron, whose tidy appearance and can-do attitude make him an ideal candidate for the integration of the Colorado Springs Police Department. Relegated to the evidence room, Ron resents his position as a token hire, pushing instead to be assigned undercover work. He gets what he asked for, but only so that he can spy on the local campus activists who've invited Black Panther Stokely Carmichael to give a speech. Ron is too square to fit in with the Black Power activists (including Laura Harrier's Patrice, with whom he pursues a romantic relationship), but he has trouble winning over his white colleagues at the police department, many of whom are clearly not comfortable with racial progress. Ron's bold move to target the KKK isn't exactly welcomed with open arms at first, but he eventually gets a few fellow officers on his side, including Flip, who gradually gets more invested in the idea of taking the group down. BlacKkKlansman is certainly Ron's story, but Lee and his co-writers broaden it into a study of multiple types of identity. Ron isn't the only one caught between two worlds, even if his position is the most obvious. The Jewish Flip has never given much consideration to his own ethnic or religious identity, but by coming in direct contact with so many people who would consider him less than human, he ends up examining his own privilege in "passing" among his Christian neighbors. Washington and Driver have a strong dynamic as Ron and Flip go from adversarial co-workers to friends united in a common cause, putting them at odds not only with the KKK but also with their own superiors. The movie drags on a little long, with some extraneous subplots (the relationship between Ron and Patrice never serves much of a purpose), but it culminates in a suspenseful series of events as Duke comes to town for a KKK gathering, where he's excited to finally meet "Ron Stallworth" in person, and where Ron (as an officer of the law) has been assigned to protect him from potential threats. It's a series of events that borders on farce, but it works best when Lee plays things straight, letting the absurdity of the situation speak for itself. The original print version of this article was headlined "Black Power"